Throughout the years of late-prehistory, AD 1400s – 1700s, and through much of the 1800s, the canoe was a principal means of travel in ancient Hawai‘i. Canoes were used for interisland and inter-village coastal travel. Most permanent villages initially were near the ocean and sheltered beaches, which provided access to good fishing grounds, as well as facilitating canoe travel between villages. Although the canoe was a principal means of travel in ancient Hawaiʻi, extensive cross-country trail networks enabled gathering of food and water and harvesting of materials for shelter, clothing, medicine, religious observances and other necessities for survival. Back then, land travel was only foot traffic, over little more than trails and pathways. These trails were usually narrow, following the topography of the land. Sometimes, over ‘a‘ā lava, they were paved with water-worn stones. 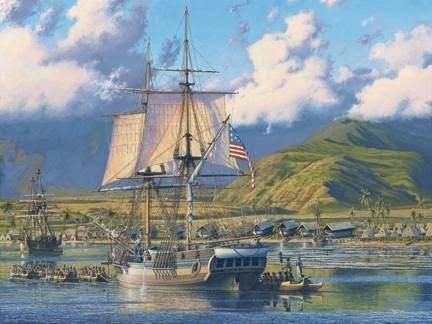 Things changed on June 21, 1803, when the Lelia Byrd, an American ship under Captain William Shaler (with commercial officer Richard Cleveland) arrived at Kealakekua Bay with two mares and a stallion on board. In the 1820s and 1830s, more horses were imported from California, and by the 1840s the use of introduced horses, mules and bullocks for transportation was increasing. In the 1830s, King Kamehameha III initiated a program of island-wide improvements on the ala loa, and in 1847, a formal program for development of the alanui aupuni (government roads) was initiated. Until the 1840s, overland travel was predominantly by foot and followed the traditional trails. By the 1840s, the use of introduced horses, mules and bullocks for transportation was increasing, and many traditional trails – the ala loa and mauka-makai trails within ahupua‘a – were modified by removing the smooth stepping stones that caused the animals to slip. Eventually, wider, straighter trails were constructed to accommodate horse drawn carts. Unlike the earlier trails, these later trails could not conform to the natural, sometimes steep, terrain. They often by-passed the traditional trails as more remote coastal villages became depopulated due to introduced diseases and the changing economic and social systems. By the early 1850s, specific criteria were developed for realigning trails and roadways, including the straightening of alignments and development of causeways and bridges. This system of roadwork, supervised by district overseers, and funded through government appropriations – with labor by prisoners and individuals unable to pay taxes in another way – evolved over the next 40 years. Paved streets were unknown until 1881. In that year, Fort Street was macadamized (a paving process using aggregate layers of stone with a cementing agent binder – a process named after Scotsman John Loudon McAdam,) followed by Nu‘uanu Avenue. In 1892, Queen Lili‘uokalani and the Legislature of the Kingdom of Hawai‘i signed into law an “Act Defining Highways, and Defining and Establishing Certain Routes and Duties in Connection Therewith,” to be known as The Highways Act, 1892. Through this act, all roads, alleys, streets, ways, lanes, courts, places, trails and bridges in the Hawaiian Islands, whether laid out or built by the Government or by private parties were declared to be public highways. The decorated buggy in foreground indicates a parade in progress in Honolulu, street unknown. Today’s ‘Timeline Tuesday’ takes us through the 1800s – horses arrive, sandalwood economy and Henry ‘Ōpūkaha’ia sails to New England. We look at what was happening in Hawai‘i during this time period and what else was happening around the rest of the world. Makawao (literally ‘forest beginning’) is an ahupuaʻa in Hāmākuapoko, Maui. It’s an area with both wet and dry forests. Growing here were koa, sandalwood and ʻōhiʻa lehua; maile and ferns thrived in these forests. In the drier regions of Makawao, sweet potato was cultivated extensively, as it was in Kula. The landscape began its transformation following the gift of (and subsequent kapu on killing) cattle and sheep from Vancouver to Kamehameha in 1793. The cattle numbers increased, in places to the point of becoming a dangerous nuisance. Roaming wild cattle destroyed gardens, scared the population and were a general nuisance. Then, on June 21, 1803, Captain William Shaler (with commercial officer Richard Cleveland,) gave Kamehameha a mare and a stallion at Lāhainā. Soon the horses, like the cattle, were roaming freely across the Islands. Most histories credit Kauikeaouli (Kamehameha III) with the idea of hiring vaqueros to manage the cattle. Joaquin Armas arrived in Hawai‘i on April 4, 1831 and stayed in Hawai‘i at the bequest of the King. Hawaii’s cowboys became known as paniolo, a corruption of español, the language the vaquero spoke. The term still refers to cowboys working in the Islands and to the culture their lifestyle spawned. By the 1800s, agriculture in the region had transitioned from a subsistence activity to a commercial one. A market was developed to supply whalers who stopped to replenish their supplies; Upcountry Maui provided vegetables, meat and fruit. In the early days only sweet potatoes had been obtainable at the Islands, but after 1830, if not sooner, cultivation of the Irish potato was taken up and during the 1840s and 1850s became of great importance. In addition to the changing landscape, there were changes in land tenure. Today, Makawao continues the Paniolo tradition and proudly proclaims its community as Paniolo Country. The community participates in an annual Independence Day rodeo and parade (2015 will be its 50th annual parade and 60th annual rodeo celebrations.) Likewise, there are regular ‘Makawao Third Fridays on Baldwin Avenue, closed between Brewer Road and Makawao Avenue. 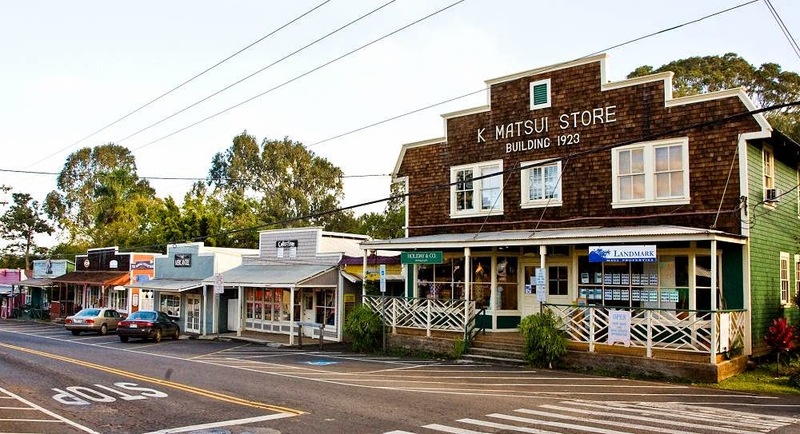 The image shows a street scene in Makawao. In addition, I have included more related images in a folder of like name in the Photos section on my Facebook and Google+ pages. Within ten years after Captain Cook’s contact with Hawai‘i in 1778, the Islands became a favorite port of call in the trade with China. The fur traders and merchant ships crossing the Pacific needed to replenish food supplies and water. The maritime fur trade focused on acquiring furs of sea otters, seals and other animals from the Pacific Northwest Coast and Alaska. The furs were mostly sold in China in exchange for tea, silks, porcelain and other Chinese goods, which were then sold in Europe and the US. A triangular trade network emerged linking the Pacific Northwest coast, China and the Hawaiian Islands to Britain and the United States (especially New England). One such boat was the Lelia Byrd. Between 1803 and 1805, she crossed the Pacific three times (over 20,000-miles of open ocean,) including numerous journeys up and down the American coastline from the Columbia River to Guatemala. June 21, 1803 marked an important day in the history of Hawaiʻi land transportation and other uses when the Lelia Byrd, an American ship under Captain William Shaler (with commercial officer Richard Cleveland,) arrived at Kealakekua Bay with two mares (one with foal) and a stallion on board. The image shows the Lelia Byrd. Most horse races last about two minutes. It’s not clear when the first horse race took place – some suggest racing dates back to 4500 BC. On the continent, following the lead from our friends in the UK, horse racing dates back to 1665, with the establishment of the Newmarket course in Salisbury Plains section of the Hempstead Plains of Long Island, New York. By the turn of the last century, horse racing surpassed all other spectator sports in popularity. And it grew, as noted in the headline of the April 30, 1953 New York Times, “Racing Now Virtual King of Sports, Topping Baseball in Gate Appeal; Horse Racing Tops Baseball At Gate”. Horse racing, which used to be called the sport of kings, was threatening to become the king of sports. (NY Times, 1953) It is suggested it is nicknamed the ‘Sport of Kings’ because the original patrons of the sport in Europe were members of monarchies, or were closely related to those who were. So, what about horse racing in the Islands? It had a kingly start here, as well. June 21, 1803 marked an important day in Hawaiʻi horse history when the Lelia Byrd, an American ship under Captain William Shaler, arrived at Kealakekua Bay with two mares and a stallion on board – they were gifts for King Kamehameha I. The captain left one of the mares with John Young (a trusted advisor of the King, who begged for one of the animals) then left for Lāhainā, Maui to give the mare and stallion to Kamehameha. This wasn’t Hawaiʻi’s only horse race track. In the late-1800s and early-1900s there was a horse racing track (Koko O Na Moku Horse Racing Track) at Kāʻanapali Beach that stretched from the present day Kāʻanapali Beach Hotel to the present day Westin Maui Resort. Races, there, ended in 1918. The Maui County Fair & Horse Racing Association developed the old permanent Fairgrounds on Puʻunene Avenue in Kahului; the Fairgrounds included a horse-racing track. The first County Fair was held in 1918. In 1939, the Oʻahu Jockey Club built the Kailua Race Track, on the Windward side. In a day and age when Seabiscuit and War Admiral were stealing Mainland sports headlines, more than 6,000 fans turned out for 10 races at the brand new Kailua Race Track. (Hogue, MidWeek) Races there reportedly continued to 1952. 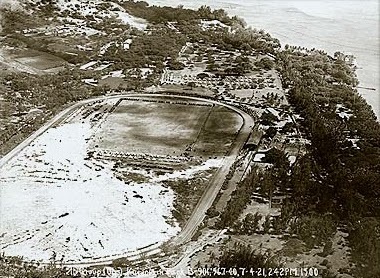 Hilo had a track at the Hoʻolulu Park; it was started in 1900 as a horse track, with a circular half-mile loop, and used for other events such as baseball. A grandstand was built in 1925 and nighttime baseball games started in 1928. (Narimatsu) After the 1946 tsunami, it was used as an evacuation center where folks impacted by the tsunami who were tended by the Red Cross workers. Every 4th of July and Labor Day, Parker Ranch continues to host its races and rodeo for thousands of participants, as well as other events throughout the year. The image shows the track at Kapiʻolani Park. I have added other images to a folder of like name in the Photos section on my Facebook and Google+ pages.